Griffin Ranch is located in sunny La Quinta California just south of Avenue 54 along Madison Street. This gated community was built by Lennar homes and offers a picturesque setting perfect for horse properties and the equestrian lifestyle. With gorgeous views of the Santa Rosa mountains, spacious living, and luxurious spaces, Griffin Ranch offers ranch-style homes with wraparound verandas, open courtyards, Casitas, libraries and much more. The architecture includes Spanish, Tuscan, mission, and Andalucia influence exteriors. 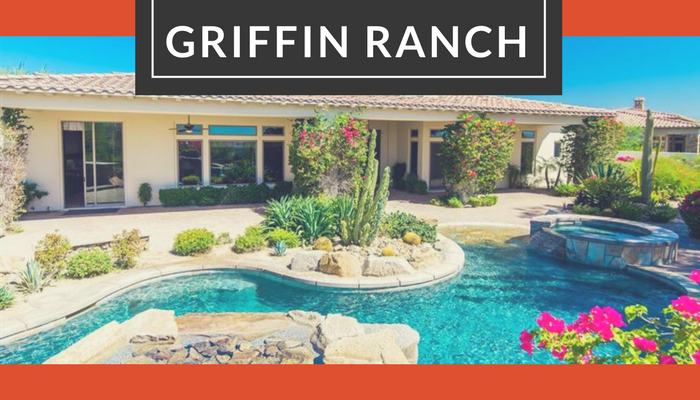 Griffin Ranch features a wide range of home styles and designs to choose from but the majority are between three and five bedrooms in spacious layouts of up to 5000 ft.² and immaculate landscaping and entertainment spaces. Most of the homes were built between 2005 and 2009. There are a variety of amenities on-site. Griffin Ranch requires monthly homeowners dues of approximately $650 per month. Each home may be required a different amount so check with each listing for precise fees. These fees cover all common area maintenance and landscaping. There are no Mello-Roos fees for Griffin Ranch. Amenities include a clubhouse, fitness center, gated entrance with 24-hour security, a beautiful green belt with picturesque views of the surrounding area and the Griffin Club, a swimming pool, trails, and tennis courts. Families with school age children utilize the nearby school district and are served by the Westside Elementary school, the Cahuilla Desert Academy and the Coachella Valley high school, all within the Coachella Valley Unified school district. To learn more contact my office today. Browse all available listings here for free and give me a call if you'd like to schedule a showing.